Plenty of rain = plenty of mushrooms. All kinds of mushrooms, too… including these black trumpets (Craterellus fallax), appearing now in Western Pennsylvania. 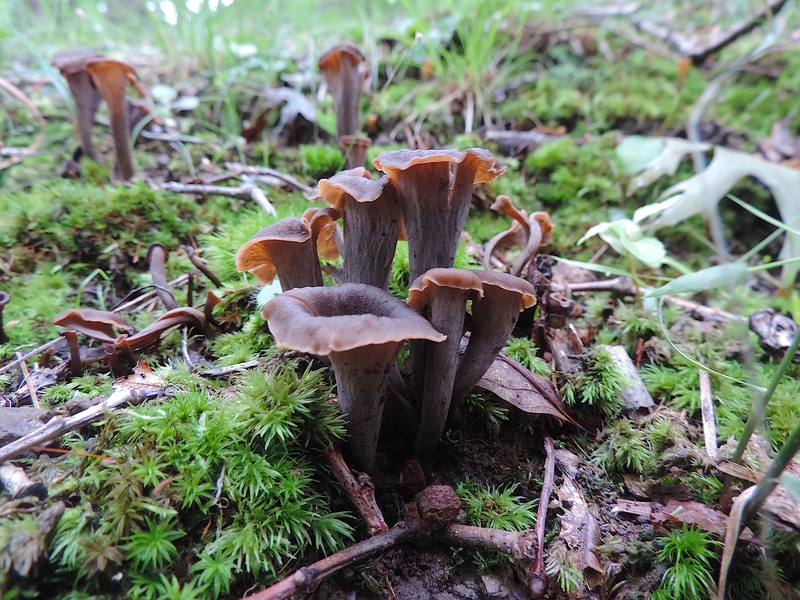 They’re delightfully edible, and if they’re anything like their close European relatives, Craterellus cornucopioides, they may contain biologically active vitamin B12. Why is this important? Well, if one were to abstain from eating an entire kingdom of life — let’s say, Animalia — a B12 deficiency could be the result somewhere down the line. Why’s this? Well, vitamin B12 is generally concentrated in foods derived from animals, like meat, milk, eggs, fish, and shellfish. A quick look at some nutrition labels may reveal the presence of vitamin B12 – for example, in the cyanobacterium sprirulina – however, what some foods actually contain is a biologically inactive form of B12, known as pseudo-B12. Vitamin B12 and pseudo-B12 are not the same; only the former is biologically active in the human body and therefore able to correct deficiencies. Enter black trumpets: According to the Journal of Agricultural and Food Chemistry (2013), black trumpet (Craterellus cornucopioides) mushrooms contain considerable amounts of biologically active vitamin B12 (1.09−2.65 μg/100 g dry weight), and may improve vitamin levels in those experiencing deficiencies. Regardless, they still taste great with eggs (and those definitely contain active B12)! Categories: Foraging, Fungi, Medicine | Permalink.